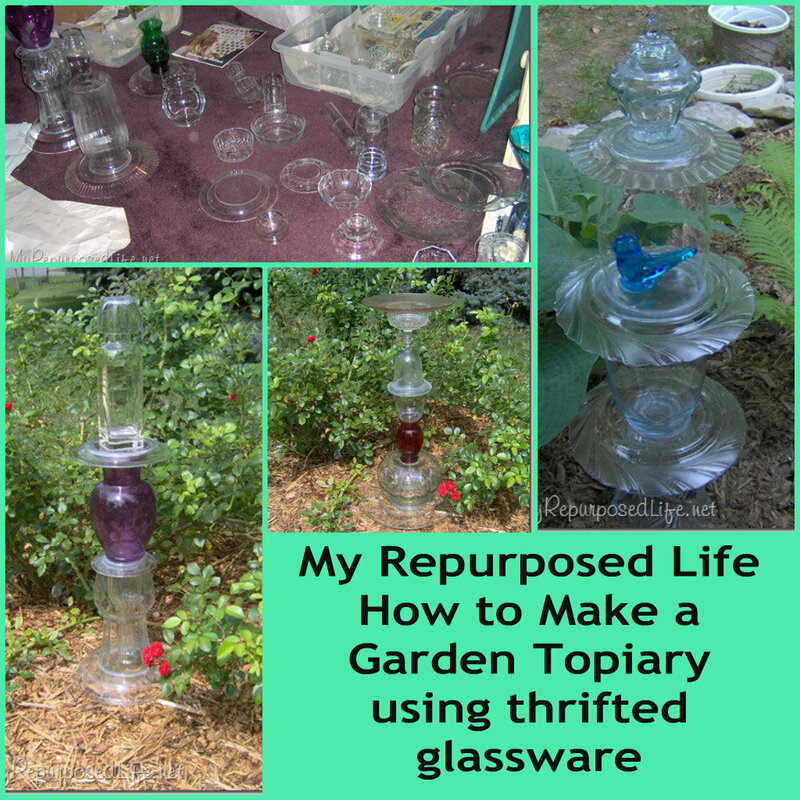 Are you looking for a way to reupurpose all that old, vintage glassware you have around the house? True trash to treasure people fall into 2 categories. Those of us who have never made a totem, and those of us who have made tons of totems. They are sort of like potato chips… betcha can’t make just ONE! In the winter of 07, I shopped and shopped for glassware. I couldn’t stop! I tried really hard to never pay more that 50 cents for any one piece. My daughter’s room became my totem workshop! I think making these totems is the closest I’ve ever come to being artistic. It is so much fun to stack the pieces and see what works well together. I really like the colored pieces of glass, however they can be a little more pricey. I really like tucking pieces inside of other pieces. In the top of this one is a cute little cherub. I love this green one. My friend Cathy has this one in her yard. This photo shows the panda totem by my Endless Summer hydrangea. Yes, that is some sort of depression glass on top. I got it really cheap, and I thought it looked really pretty on this with the red vase. My friend Cathy has this one in her yard also. This is my “bluebird of happiness” totem. 🙂 The bottom vase of this piece is a beautiful candle holder that one of my former students gave me. Part of it got broken, but I held on to it because it was so pretty. When I started putting pieces together for my totem, I knew it belonged with these other pieces. Some tips about making totems. I recommend that you move your totem to a protected area during the winter or freezing weather. It’s best to wash and dry all your glassware very well. If it is extremely humid, or if your glassware is not totally dry, moisture will build up inside. I used silicone II for doors and windows. It comes in a tube that you have to use a caulk gun with. After you apply the caulk to join 2 pieces, release the pressureon your gun, and your caulk will not ooze out. after gluing 2 pieces together, you can use a rag or a paper towel to wipe off excess caulk. I glued in sets of 2, I then waited for those to dry and joined 2 sets of 2 together at a time. if you do end up with a leaning tower, you can carefully use an exacto knife to undo the silicone. Please remember a leaning tower is better than a trip to the emergency room! Now, get out there and buy some glassware, dig through your cabinets and garages. BUT, don’t say I didn’t warn you. This is highly addictive! Have fun creating! I have done some more totems-you can see them in my post Repurposed Glassware Totems & More. What a fun idea, and I’ve been wanting some more yard art. These would be simple and pretty! Pinning! figures inside of the larger bowls and vases and my idea is to make a pole with an angel inside one of the tall vases to use ans my gardian angel and also make one with a cat to use in a small garden especially for him or her with their own garden of cat nip, mints and other plants they aren’t allergic to so they can have their own special place. There are just so many ideas going through my head now it’s hard to decide which one I want to start with. Got to go to all the yard sales and thrift stores and build up my supply, my goodness will we all be busy from now on. Thank you for sharing your ideas with all of us, so many want do that and they just don’t know how much they will be refunded when they share, thank you again and have fun creating with the blessing of a creative mind. Be careful, these hobbies can be very addicting. Placing these pieces together is only half the fun. The real fun is hunting for the glass items at yard sales and thrift stores. That is the part that can become the real addiction. Enjoy, and thank you for your sweet comment, I truly appreciate sharing what I lean with others. happy you stopped by My Repurposed Life Elaine. I haven’t made any of these for a while. But I still love the ones I have. Gail, I want you to know how much I enjoy seeing all your projects. You are truly an artist and so creatiive. 🙂 I have a bunch of glassware and dishes that I have received/inherited over the years from my mom, my grandmothers, my mother-in-law, the list goes on and on. I had thought about donating them until I saw your garden totems. I now know what I will be doing with the glassware and dishes. I will create them in honor of all the wonderful ladies in my life that I miss every day. They will make beautiful additions to my yard and wonderful gifts for family members.. Thank you again for all your inspiration and please keep up the good work. Thank you so much for your very kind comment. I appreciate it more than you know. It warms my heart when I can inspire people to use what they have, and the fact that you will be honoring your family members is even better. Oh Gail. I’m an indoor addict making tiered dishes. Once I started I just couldn’t stop. Yesterday’s haul brought home more than i have a place for. Now I need to be super creative. Thanks for posting about outdoor totems. I wanted to make a bird feeder but we do have a lot of squirrels.If I put it too low, the rain will pool and the blue jay’s will make a big mess, too. So I think I’ll stick to indoors. I had a thought of my bare front porch but if someone knocked it over we’d both be devastated and I’d hate to have to take a friend to urgent care, too. I just found this I am so excited can’t wait to go looking for glass I want a totem pole !!!!!! Wish I had run across this a couple yrs ago I closed my floral business and gave away some of the most beautiful vases to friends and family. I am working in my back yard and on my patio redoing everything. I have a punch bowl I wanted to do something with think I will try to include it in my project. Wnat more colored glass? Here is a tip-mix food coloring with Elmer’s glue and paint the inside of some of the clear vases-ones that you will be using upside down so water can’t get into them to wash out the “paint”-I have also heard that you can put clear sealer over one painted with this and keep it from washing off. Anyway -that would be a way to get colored glass cheaper and your color options are infinite! For instance mix blue and green together to make an aqua vase. I make these a lot! and you are right, they are addictive. I use e-6000 for mine and they stay out all winter. The only problem I have is putting things insid eof other things. Even though I let them dry the item inside sometimes comes loose. Any thoughts? Use try 2 types of glue. One to glue the center and one around the outside. I used liquid nail and E 6000 on an item that keept sliding. Great tutorial i wish i had read this before i started. You are so correct about collecting more glass and the joy when your piece comes together. Thanks for sharing. I’ve seen similar items on other sites and one of the things I’ve seen done is to use a small opening on a base piece turned upside down, then you can place the small opening over a dowel or copper pipe pushed into the yard to give the piece more stability, of course I’ve seen them with bud vases on the bottom upside down and then sitting on the copper pipe but the idea would work just as well for a piece you could place inside your larger base glass for more support. Just found your blog and have to tell you I LOVE this idea, have never seen it before but cannot WAIT to try it for myself! I am so excited, I will be devouring the rest of your blog, thank you for sharing your talents and inspiring the rest of us!! I may be two years behind…but I am SO into the idea of making some garden totems from the pottery that I got while thrifting last weekend! Can’t wait to get some done…and no, I don’t think I’ll be able to stop at just one! Came across your blog through an internet search. My mom (and now me) has just gotten into doing this. You have some really cool stuff. And it’s done a little different that what my mom has been doing. She typically has a smaller vase on the bottom so she can display in on an iron rod. But sitting them right on the ground is a great idea. I’m going to have to share your way of doing it with her. Great tutorial, and some very helpful suggestions! I’ve been dying to make one of these; the original one I saw was on a pole, but the blogger didn’t give instructions, so I guess I’ll have to figure that part out. Thanks for the great tips! My sister and I made some to put on poles of regard. Use a upside down bud vase for bottom. If the opening is to big insert a piece of garden hose into neck of vase to stabilize. I use a shorter length of debar so my totem sets on the ground. Sorry but that should have read “rebar” poles. Beautiful Gail! I’m happy to see that your blog is so wildly popular! You are amazing!! I hope you’re enjoying the summer! Now I’m so bummed that I tossed a bunch of vases I never use to the Goodwill. I wonder how I missed this post? Anyway, I’d like to try one of these– but am afraid Honey might not go for it. when I was a kid (long time ago)we had a teacher that would make these for the kids, but then he covered them with paper mache then painted them and they were used as candle holders.